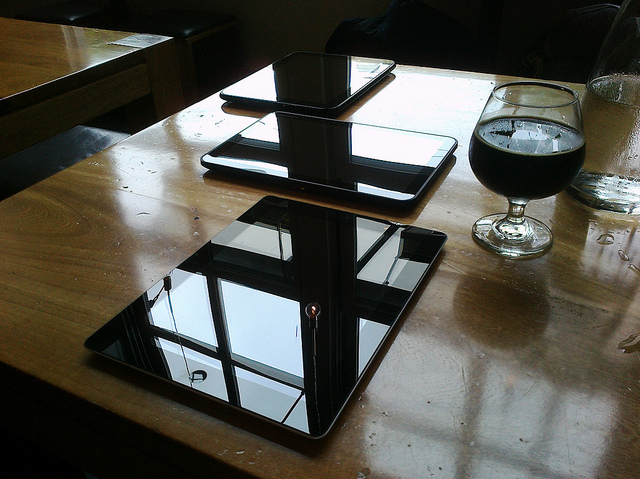 Three tablets – iPad 2, Motorola Xoom, and HP Touchpad. Improving like wine with age, or corked? Photo (CC-BY) Justin Ried. Richard Lawler, an experienced commercial iOS developer, has been spending a lot of time evaluating Android tablets. I prodded him to give the video output on the Android Honeycomb Moto XOOM a go, and he kindly shares his results. The hardest part of all of this, bizarrely, is just finding the cable. The XOOM has a dedicated port, which gives it a subtle but meaningful edge over the iPad 2, even with Apple’s special dongle. But while micro HDMI is not proprietary to Motorola, good luck finding a cable at point of sale. After seeing an absurdly-expensive Radio Shack option, Richard wisely headed to Amazon and spent just a few bucks. I got my micro HDMI cable, and it works fine with the Xoom. You just plug the Xoom via the micro HDMI cable into an HDTV and it mirrors the display. Audio is also sent out via HDMI. If the current app does not support landscape (e.g. Scene Player) then the screen remains in portrait mode but displayed sideways (90-degrees CCW) on the HDTV. In portrait orientation the Xoom’s left-most 80 pixels are chopped off the bottom of the HDTV display. The HDMI mirroring supports digital audio out. I don’t know what the latency is for the digital audio, but audio seemed to be synced with video sources. It is difficult to break-out the digital audio signal from an HDMI signal without a special black box. Although many HDTVs like my Samsung model split out a digital audio signal from an HDMI input. Apparently the Xoom HDMI output is limited to 720p as is the Xoom’s video camera recording. I am happy with the Xoom’s HDMI. It’s simple and works pretty much as you would expect. The digital audio output seems promising too. I’m wondering about the practicality of using HDMI for audio output on other Android devices like the EVO, Droid X and others. I briefly experiment with my EVO with my new cable. With the micro HDMI cable plugged in it outputs any video AND audio via HDMI, but it doesn’t mirror the display. For example PdTest’s audio output worked fine out the HDMI. I also got a USB gender changer, but I have had no luck with it. Xoom/Honeycomb sees neither the QWERTY keyboard nor mouse I have tried to attach. As I mentioned before, the MicroSD card slot is not yet functional on the Xoom/Honeycomb. In fact the slot holds a dummy plastic card that says “Replace with MicroSD only after Android system update”. This is only a casual hands-on test to get the discussion rolling, literally copied out of an email thread with Richard, so your mileage may vary, but it’s nice to hear these impressions as a start. You can read Engadget’s disappointment with iPad 2’s HDMI output, but I’ll be curious to hear from developers on that front. All in all, with either Apple or Android, it’s early days, but I’m liking what I’m seeing on both sides. Ironically, I think the bigger challenge on the XOOM may be working out a VGA output rig from the HDMI for dealing with projectors that still want VGA and 4:3. Expect more detailed information to come, particularly if I manage to pick up a XOOM to test with Processing, OpenFrameworks, and native development alongside my (first-gen) iPad. But I did want to provoke the beginnings of that discussion now. The NVIDIA graphics in the XOOM – and the graphics chipset in the iPad 2, as well – are nothing to sneeze at. While laptops easily trump tablets for power and flexibility, there is some potential for the tablet in your digital visual arsenal, too. I look forward to seeing more.